Svalbard is like the other Artic/Antarctic regions in that it is expensive to travel too. From the locations, Iceland/Greenland/Churchill (Manitoba)/Alaska/Antartica, that I have done at least preliminary research, I would argue it is the most expensive of all the locations once you get there assuming that you want to do a cruise. The caveat is that costs to travel to these remote locations can vary quite substantially from your destination. You will need to be quite diligent in looking out for the best airline deals. **You can do a multi-city trip with a layover in Oslo at no extra cost from my test. This would allow you to also spend time in Scandinavia. *SAS considers a flight to Longyearbyen domestic; as a result, you can utilize a SAS Eurobonus award ticket from from any location in Scandinavia to Savalbard for just 12K Eurobonus points. Since this is popular location to utilize your points and limited spots, you will need to book early. 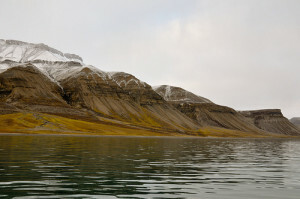 Svalbard is composed of a number of islands with the largest island being Spitsbergen. 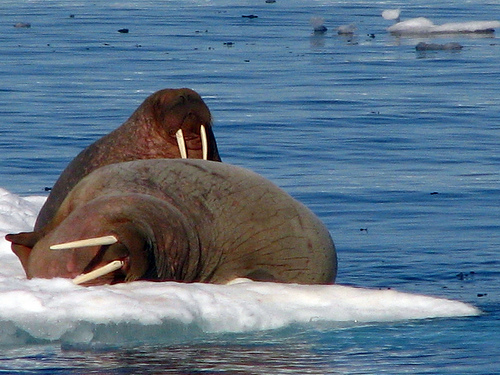 Most cruises will cruise around Spitsbergen and not Svalbard. All of Svalbard has only 2,500 people with 1,800 of them being in Longyearbyen. 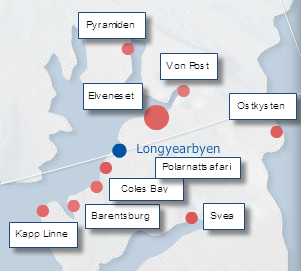 All flights will be in and out of Longyearbyen. 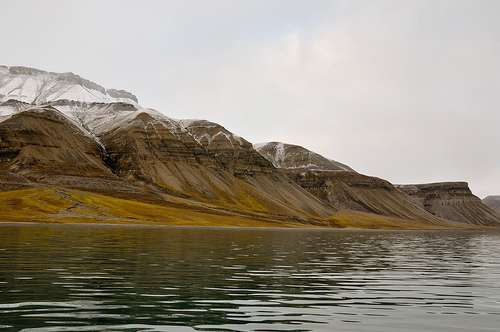 There is one road to a mine site, but for the most part, there are no roads in Svalbard. 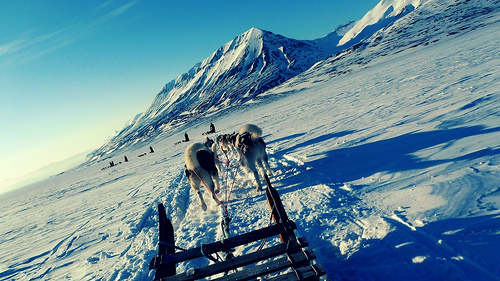 In the winter, you get around the island on Dog Sleds and/or Snowmobiles. You can also take boat in between locations. When to go to Svalbard? Since Svalbard is so far north, it is very cold. The most popular time to visit is from June to August when most cruise ships leave Longyearbyen. Several people indicated that most Norwegians go form end of March to mid/late May. There are supposedly 3,000 Polar bears in Svalbard and only 2,500 people. It is the closest location to Europe where you have a “good” chance to see Polar Bears. This is not Churchill, Manitoba where you can expect to see 10 to 30 Polar Bears a day in October/November, but you do have a realistic chance of seeing a polar bear. Your best chance to see a polar bear is seeing them on the ice pack in a cruise. While polar bears do come into Longyearbyen, you are not likely to see them in town. 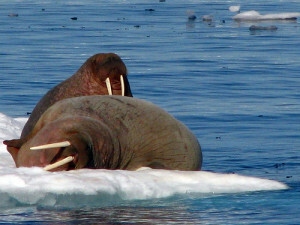 The other awesome mammal that you can see is the Walrus. They are prevalent in various locations around Svalbard. It is again unlikely to see them in Longyearbyen. You will have the best success on a journey. You also have the opportunity to see a number of whales. One can also see other common artic wildlife from reindeer to artic foxes. While being far north, it is almost too far north. Many visitors from my readings do see the Northern Lights in Svalbard, but they are not as vivid as they are in other places in the world. The end of September to the end of March is the best times to see the Northern Lights. If you want to minimize your costs, it is probably best to stay in the main town of Longyearbyen. Cruise costs will run several thousand or more. In this next section, I talk about the activities that one can do in Longyearbyen versus taking a cruise around Spitsbergen/Svalbard. Cruises in and around Svalbard are extremely expensive. There are probably a dozen to two dozen cruise ships that travel in and around the island. In order to cruise around the island, you need to wait for the ice pack to melt. The highest rates of success will occur towards end of July and into August. This is why most cruise lines have a disclaimer that if Ice pack is still frozen that they will go how they came. It is IMPORTANT to realize that this is the CHEAPEST room option. If you want a better room, you can easily add a couple of thousand dollars on top of it. This is also assuming double or triple occupancy. Traveling solo will mean a 1.5x to 1.7x the initial cost. There are cheaper options that don’t go entirely around the island. These are the cheapest ones that I found while looking. 5) Akademik Sergey Vavilov: Trip up North similar to Trip #2; 9 days – ?? This is again the cheapest accommodation that these companies offered. The prices would be hire. One can easily see that the trip to Svalbard is not cheap by any means. I feel it is more expensive than Antarctica because there are last minute tickets where a person can get a 11 day cruise for $3,500. Longyearbyen is the most populous town in all of Svalbard. If you don’t want to spend thousands of dollars for a cruise, the odds are that you will still spend a thousand or two even in Longyearbyen because there are limited options for traveling by yourself. Traveling on your own outside of town is very risky because of the polar bear situation. As a result, you always needs to be accompanied by a guide. Multiple people indicated that you should try to book your tours ahead of time and not wait until you get there because the most popular trip get taken. There are lots of tours in the two different seasons. Many people rave about the snowmobile trips. You supposedly have a decent chance of seeing polar bears on the East Coast. You do not have a good chance on the dog sledding trips. It seems that most people pick one activity from each category. If they come in the winter, they will go snowmobiling and dog sledding. If they come in the summer, they will go on boat trip, go hiking, go and kayaking. Dog sledding and ATV Safari seemed less common in the summer. If you went on Snowmobile Safari to the East Coast (2,350/1,200 NOK = $410), Dog Sledding (980/780 NOK to $170), and Ice Caving (730/390 NOK = $127). This would mean winter activities would cost $700 over 3 days. The Snowmobile Safari would be the longest activities at 10 hours compared to Dog Sledding that is 3 to 4 hours. If you went on a Boat Safari (1850 NOK = $323), Hike to Trollstein (990/660 = $173), and Kayaking (950 NOK = $165). This would mean summer activities would cost ~$700 over 3 days. You can see that the costs can vary substantially between doing the cruise versus just visiting Longyearbyen. Cruise is at least twice as expensive as traveling just in Longyearbyen.